AMES — At the beginning of the basketball season, Iowa State head coach Steve Prohm grabbed two green disposable Gatorade cups. He taped both cups and wrote “Swagger” on one and “Confidence” on the other. Prohm has a young team that got younger fast due to injuries and suspensions. All four true freshmen are playing bigger-than-expected roles. And Prohm needed a way to keep their confidence and swagger up. 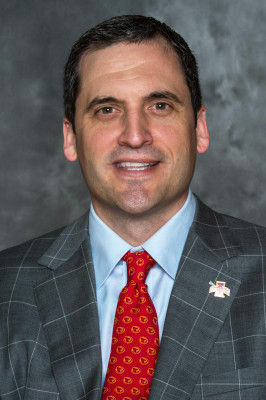 As they would come in to practice, Prohm “threw” swagger and confidence on them out of the cups. But as the season has gone on, the players have embraced the two cups. Weiler-Babb said it’s grown into something deeper, too. You’re not just throwing swagger and confidence at guys, you have to pour yourself into the “cup” (the team). On Thursday, the Cyclones’ freshmen might need an extra dose from the confidence and swagger cups as Iowa State (7-1) travels to Iowa City to play 18th-ranked Iowa (6-2) in Carver-Hawkeye Arena. It’ll be the first true road game for the rookies – against an in-state rival no less. “I think this is a great challenge for (the freshmen) and for (the team),” Prohm said. “I think they’ll be fine. We have to understand that they’ll face some adversity whether that’s a tough call, a turnover, you’re trailing, you’re going to have to whether the storm of a run ... Can we be focused in timeouts? Prohm has said multiple times this season how much he likes the attitude, demeanor and personality of this freshmen class. Wing Talen Horton-Tucker is Iowa State’s third-leading scorer at 14.5 points per game and the second-leading rebounder at six rebounds per game. He’s also proven to be a good defender. He has 17 steals in eight games and Prohm said he leads the team in charges taken. Guard Tyrese Haliburton is the sparkplug off the bunch. Jacobson said he’s never seen Haliburton not smile. Haliburton averages 7.4 points, shooting 55 percent from the field and 40 percent from 3-point range. He also averages five rebounds and three assists. To go along with his offensive output, he’s recorded 18 steals and blocked nine shots. Big man George Conditt hasn’t quite developed his offensive game yet, but he’s proven to be a force on the defensive end. The 6-foot-10 freshman averages just 10 minutes per game, but he’s averaging nearly two blocks per game. In the last game against North Dakota State, Conditt blocked five shots in 10 minutes. Lastly, Zion Griffin is a versatile wing defender who also averages 10 minutes per game. He’s coming off MCL surgery, but he’s shown he still has his explosiveness, pulling down three rebounds per game in just 10 minutes. Jacobson said the joy and youthful abandon that they play with has actually helped him, too.